This luxury bouquet of flowers comprises Rock Star Roses, Red Dahlias, Red Bouvardia, Red Hypericum, AStransia and Seasonal Foiliage. Categories: Mother's Day Flowers, Romantic Flowers, Roses. 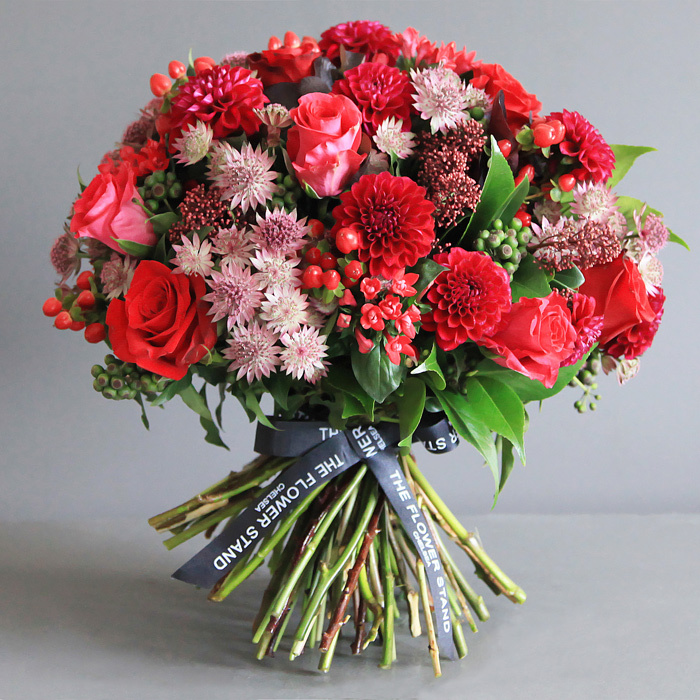 Rock Star Roses, Red Dahlias, Red Bouvardia, Red Hypericum, AStransia and Seasonal Foiliage. The reds and pinks of this beautiful bouquet scream romance, so why not give that loved one the perfect surprise gift in the form of a stunning bunch of flowers. As with all of our bouquets, our florists hand pick your Roses, Dahlias and other stems from our stunning array of flowers, creating your beautiful bouquet to order. You can be sure that that special someone receives their gift on time as we offer you the choice to pick a specific delivery date for your flower delivery. This includes same day flower delivery throughout London, or next day delivery in the rest of the UK. 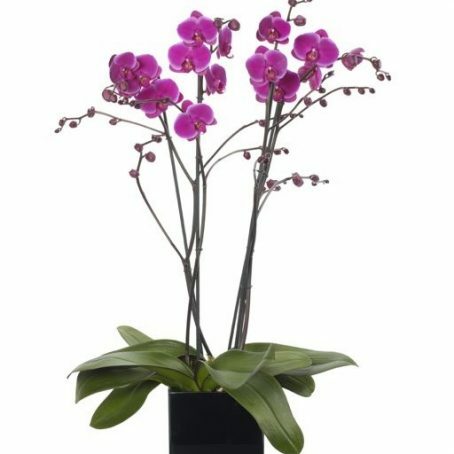 Magenta Pink Double Orchid Planter, including a choice of one, two or three double magenta pink Orchids in a beautiful black cube vase. Your Orchids will be delivered in full bloom ready for immediate display and enjoyment. Black Bacarra Roses, Purple Anemones, Red Hypericum and Red Tulips.